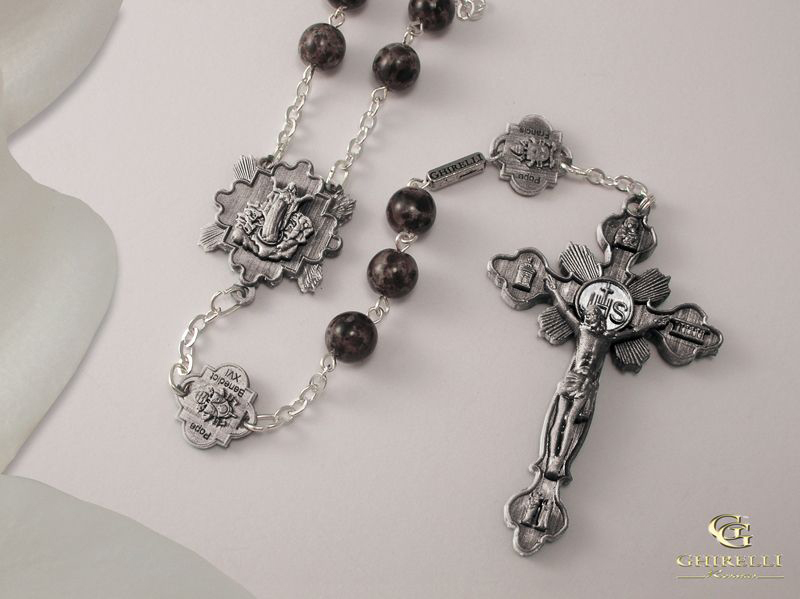 Description: This treasured keepsake Rosary has been designed specifically for St. Mary Basilica, and was inspired by its beauty and history. 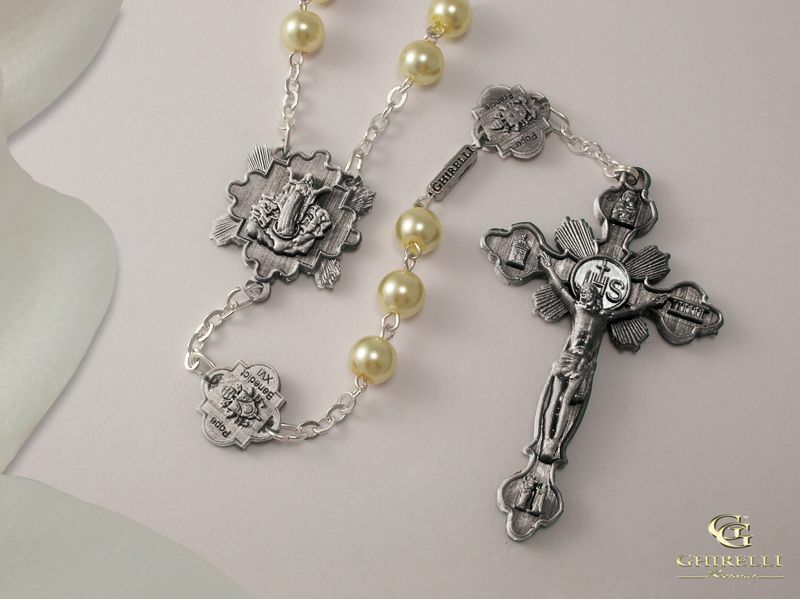 The Rosary’s design is as unique as the Basilica itself. 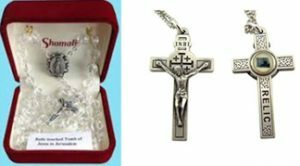 The Rosary comes in a beautiful gift box with a photograph of the Basilica on the lid, along with a booklet containing a letter from Msgr. 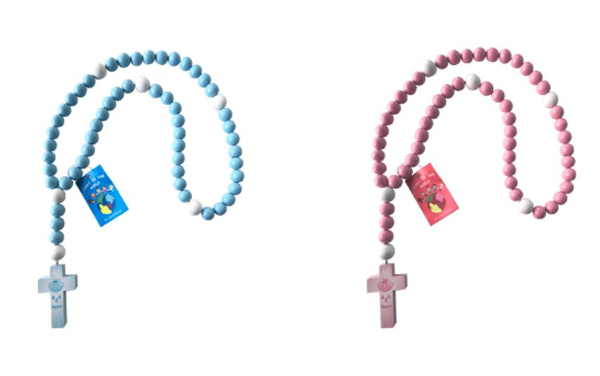 Campbell, a description of the Rosary and a brief history of the Basilica. The Crucifix on the front side features our Holy Family, Tabernacle, Perpetual Help Icon, and the Altar; all representative of the Basilica of Saint Mary of the Assumption. On the back of the Crucifix is the name and city of the Basilica. The Centerpiece displays the image of the Assumption of Blessed Mary from the Basilica on the front, and the exterior Basilica building on the back. The Our Father Medals display the Basilica coat of arms, and those of Pope Francis and Pope Benedict are on one side of the medal, and Marian Symbols from the Basilica’s dome on the other side. The Beads are either white pearl or black glass beads. Crucifix: 2.25” x 2.5” H.
Centerpiece: .75” x .75”. Beads: 7 MM glass. 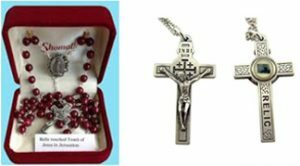 Description: With exclusive art from Michael Adams, this gorgeous Cameo Collection rosary and rosary box from Sacred Traditions™ is carefully designed with fine detail and ornate embossing. Each richly crafted and detailed style has been inspired by vintage jewelry and is sure to become a treasured heirloom. Resin/Pewter Finish. 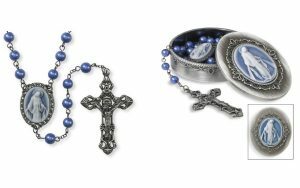 Dimensions: 7 mm Faux Periwinkle Blue Pearl Bead; 22.5″ L; 1″ Centerpiece 2.25″ Crucifix. Gift Boxed (2.125″ W x 2.75″ H x .875″ D). 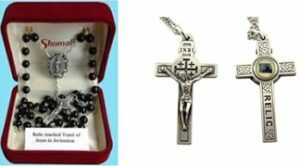 Description: These beautiful rosaries are made with a pewter cross, 7 mm glass beads, and with a relic touched to the Tomb of Jesus in Jerusalem. Comes gift boxed.